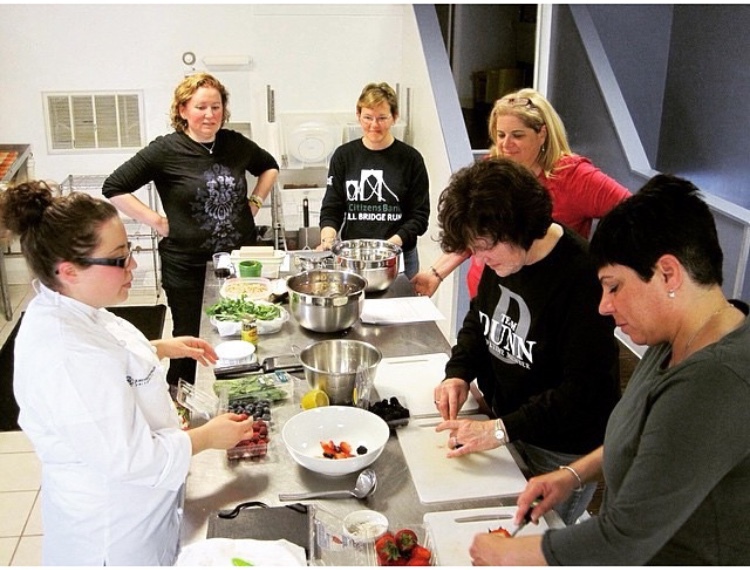 In 2014 I as asked to teach a gluten-free cooking class at Newport Cooks in Newport, RI. 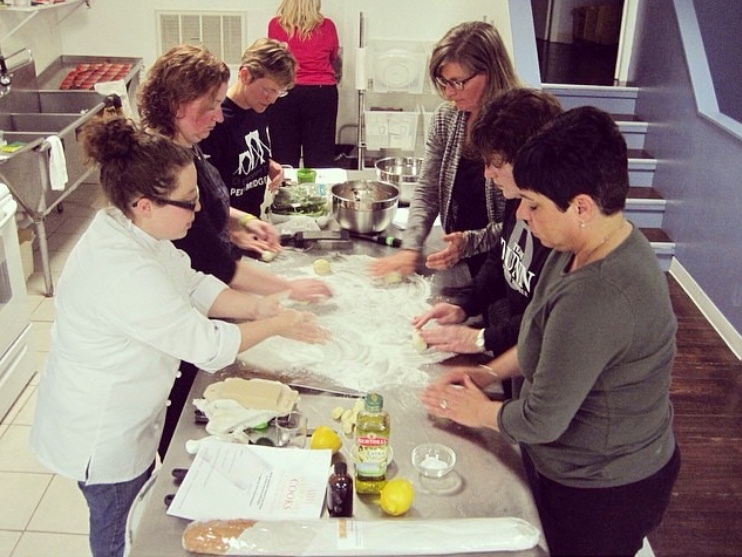 Our theme for the class was Gluten-Free Italian. Gnocchi is one of my favorite dishes to make. This recipe is a gluten-free version of an Italian classic. We served this up with a light pesto, and our other dishes were a Tuscan White Bean Salad, and Mixed Berries with Mascrapone. 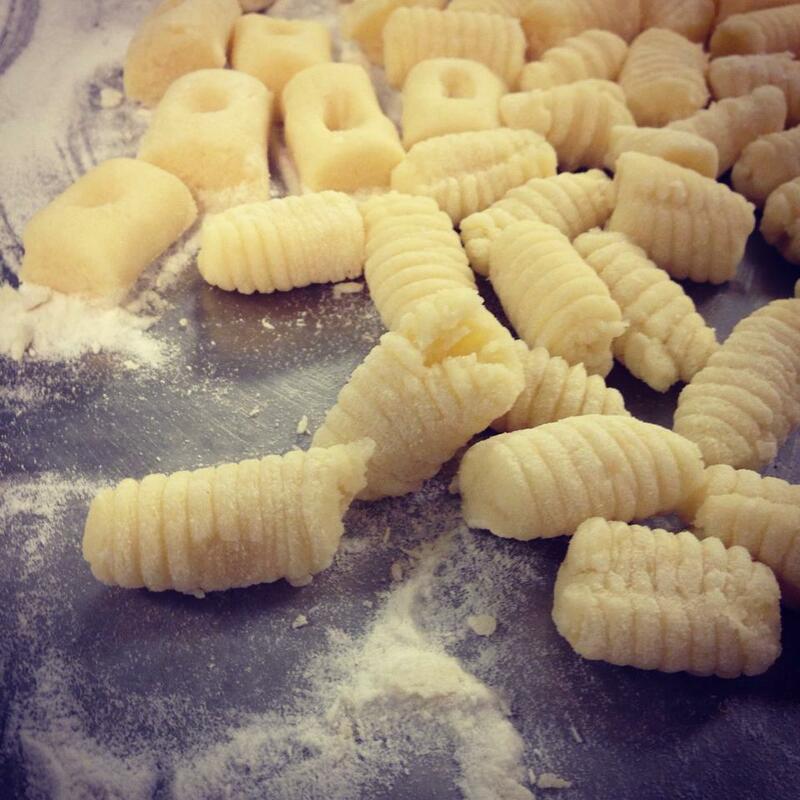 Gnocchi is said to come from one of two Italian words; nocchi which translate into knot in wood or nocca which translates to knuckle; both are rather fitting. 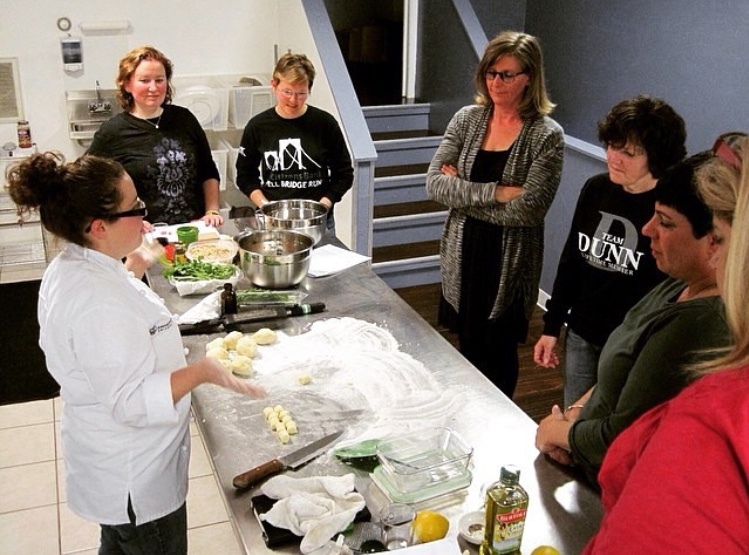 As with many Italian dishes; variations vary depending upon the region in which they are prepared. Obviously in the gluten-free version you are missing the elasticity (gluten) from the wheat, so it is important that the potatoes used in this recipe are starchy such as a russet or Idaho potato. 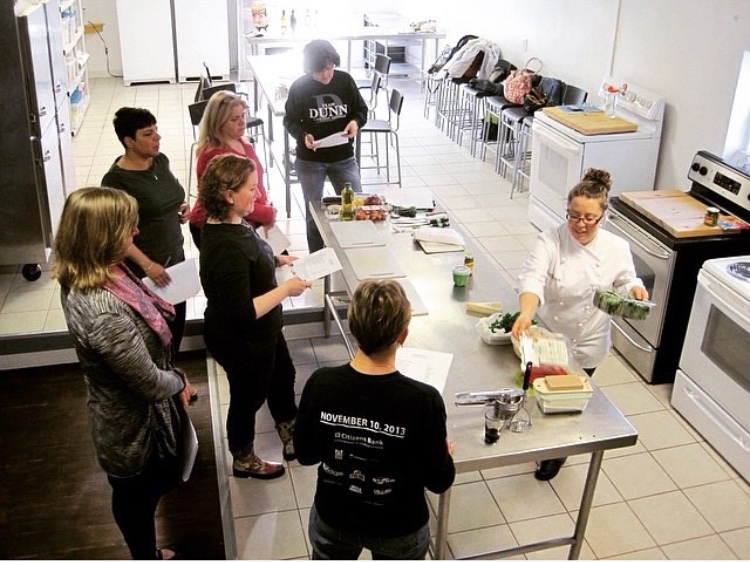 A second tip; bake the potatoes, don’t boil them – this will help to hold the gnocchi together in the cooking process as they will absorb water better than boiled potatoes. I’ve tested a bunch of different flour combinations including brown rice flour; which works, but my favorite combination is white rice and sweet white rice. The flour combination is rather simple, but honestly it is all you really need. I have been asked from many people if you can omit the sweet rice flour and use all white rice or brown rice flour instead. You could, however the gnocchi will be on the softer side. Sweet white rice, is ground glutenous rice (sushi rice), a short grain rice, that adds stability to the gnocchi without adding a gritty texture to it. Pierce the potatoes a few times with a knife or form and place on a baking sheet. Bake the potatoes until tender – about 45 minutes – 1 hour. Remove the potatoes from the oven and allow them to cool. Once cooled whisk together the white or brown rice flour with the sweet white rice flour and set aside. Lightly flour a clean counter surface with the flour mixture. Peel the potatoes and pass through a potato ricer (or mash, or grate them), onto the floured counter. In a small bowl mix the eggs and 1 teaspoon of kosher salt and pour over the potatoes. Work the egg mixture into the potatoes by using a fork until the potatoes begin to come together. The mixture at this point will be sticky. Slowly incorporate the flour mixture ½ cup at a time into the potato mixture and begin to incorporate it with a fork. Once the dough begins to come together begin kneading the dough by hand, adding more flour as needed so it is firm and not sticky. If you dough is still sticky add additional flour – ¼ cup at a time. 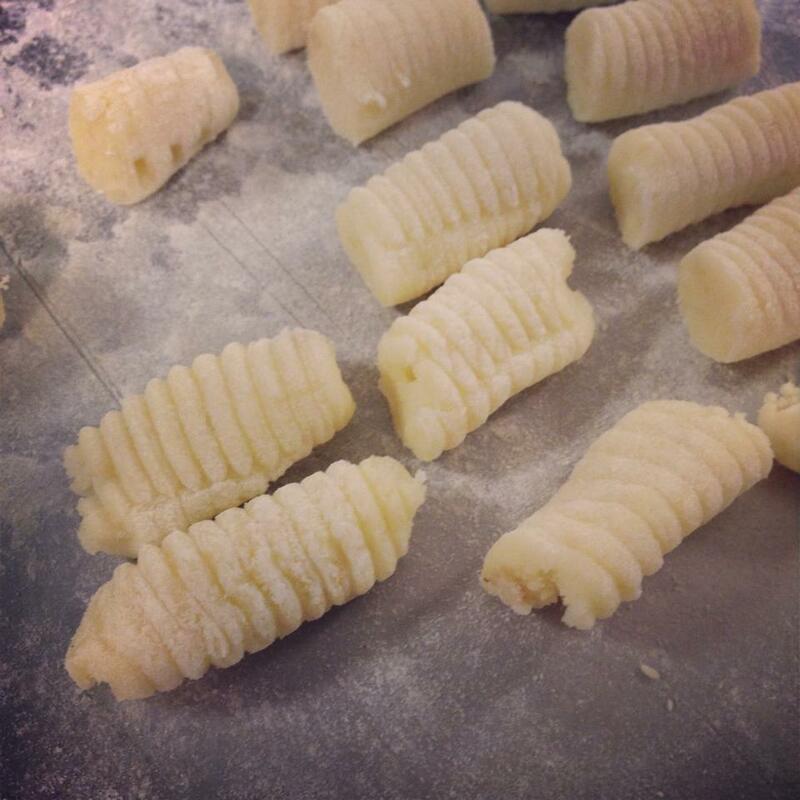 Want to test your gnocchi at this point? Add a piece or two to a pot of boiling water and if it holds together you are all set. Divide the dough into quarters, and then into quarters again. Cover the dough with a damp tea towel or paper towel. Remove one piece of the dough (1/8) and roll it out into a log. 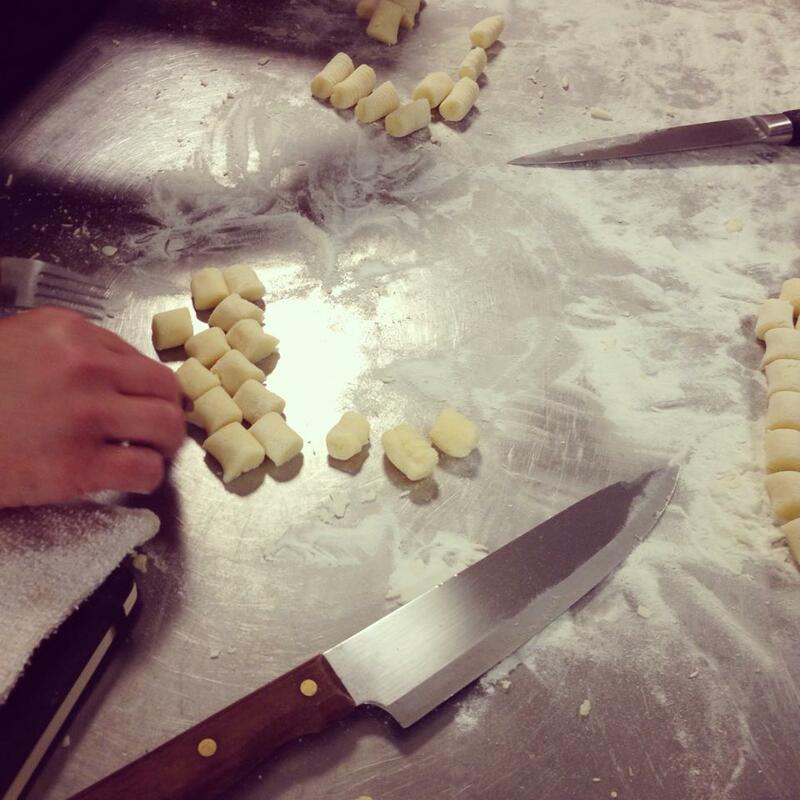 Cut the log into bite size pieces and you can shape them several ways: by pressing a small indention into each gnocchi or by rolling it over a fork or a gnocchi board. Place shaped pieces onto a lightly floured (white rice) or parchment lined baking sheet until ready to boil or freeze. To freeze gnocchi place in a single layer on the baking sheet and place in the freezer until hard. Then store in a plastic freezer bag until ready to use. To cook the gnocchi – boil a large pot of salted water. Cook in batches so you do not over crowd the pan in boiling water until they begin to rise to the top – taste a piece to make sure it is cooked throughout. Special equipment needed: a ricer, potato masher, or grater. You can boil the potatoes but I have found that baking them works better. Some recipes call for just white rice flour but the combination of white rice/brown rice and the sweet white rice flour is my favorite.